Pentax already has a 100mm macro option in its range - the Pentax smc D FA 100mm f/2.8 Macro - but this newer version has the advantage of weather resistance. This combines six separate seals to keep out moisture, together with a Super Protect coating on the front element to repel any droplets, dirt or grease, making it an ideal match for Pentax's weatherproof K-5 and K-7 bodies. Designed for digital but equally happy on one of Pentax's film SLRs, the lens has an effective focal length of 153mm when used on one of the company's APS-C bodies. It boasts a 1:1 reproduction ratio and contains eight rounded diaphragm blades for circular bokeh, while the smc in its name tells us that Pentax has used its Super Multi Coating technology to help increase light transmission and minimise aberrations such as flare and ghosting. On the inside it inherits the optics of a Pentax smc D FA 100mm f/2.8 Macro lens, with nine elements arranged over eight groups. Its focusing system, driven by a motor inside the host camera's body, travels between a minimum distance of 30.3cm up to infinity. Pentax has also equipped the lens with a Quick Shift Focus system, which sounds a little more complicated than it actually is - namely the option of fine-tuning focus manually once autofocus has been confirmed. Instead of a focusing window, the barrel simply has markings to indicate both distance and reproduction ratio, which goes some way to giving it a refined and almost Zeiss-like quality. 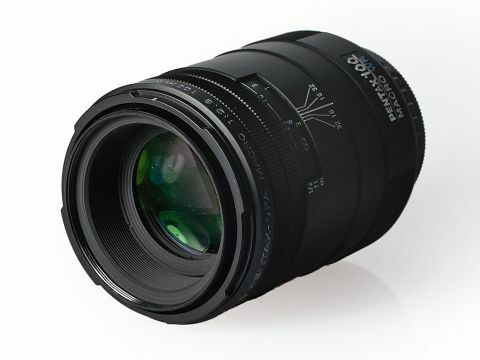 The Pentax smc D-FA 100mm f/2.8 macro WR lens stands out from its peers for two main reasons. First, it's particularly compact for its size, with a 65mm diameter and a 49mm thread. Not only does this give it an advantage for portability, it also means that any filters used are likely to be cheaper than those bought for larger filter threads. Second, its aluminium barrel gives it a superb build quality, and its minimal design makes a nice change from what we're used to seeing at this level. In the hand the lens feels solid, and arguably better built than more expensive optics with plastic casings. And with the further benefit of its weather sealing and Super Protect coatings, it can be more safely used in a broader range of shooting conditions. Sadly, it also stands out for a handful of more negative reasons, such as for its focusing system, which is among the noisiest we've come across on such a lens. With no internal focusing system, it also drives the inner barrel out anywhere up to an extra inch and a half. Both of these points make it a poor choice for shooting live subjects. There's also no way of limiting focus to one side of the range, which today is a fairly standard feature of macro lenses. This may be to preserve the simplicity and symmetry of the lens' design, but it doesn't particularly help with focusing times.